Vinyl transfer stickers are precisely manufactured to follow your custom design. Available in virtually any color. Made from quality 4 mil vinyl, cut and laminated with installation transfer tape. They will be both weatherproof and scratch-resistant. Stick them to any smooth surface, indoors or outside, and they will last for years to come. These are the style stickers you typically see used by professional athletes to tout their sponsor's logo. You also see them on cars, windows and glass door. They offer a premium look. See Prices for Round or Square Dimensions. See Prices for Oval or Rectangle Dimensions. Yes. Stickers are Weatherproof, Labels are not. That is why labels cost less. Our stickers offer 3-4 years of weatherproof durability. They will hold up in the rain, sun, snow, dishwashers, microwaves, etc. Do you have matte stickers instead of glossy coated? Yes. We can. If you are interested in this option, please contact us by email phone or chat with your request. Can parts of the brushed alloy or mirror stickers be opaque colors? Yes. They can be. We can do both reflective areas as well as flat colors. Please contact by email or phone or chat on our website to learn more. Can I get samples of your sticker materials? Yes. We offer a sample pack. There are many ways you can get a free sample. Start here by filling out the free sample pack request form. What is your most popular custom sticker material? Our most popular sticker material is the Eco printed glossy coated vinyl. This media type offers a quality print of all designs and has the lowest minimum. These stickers are also scratch resistant and weatherproof. Can you make super durable stickers? Yes, we have laminates that stand up with repeated abuse on football helmets, motocross bikes etc. Can you make wall stickers? Yes. We make much more than just stickers. We offer a media the same as being used by Fatheads. The material is very thin vinyl with a special adhesive that does not damage paint or wall or leave any residue. Contact us by email, phone or chat get your project going. What file types do we accept? We accept PDF, PNG, JPG, SVG, TIF, GIF, BMP, AI, PSD files. We suggest a CMYK PDF for the most accurate colors and precise printing. These are two different color models. RGB is used for screens such as your computer screen. CMYK is used for printing, such as your stickers. For your colors to be the most accurate in printing, create your artwork in CMYK colors. Your colors will match your expectations when you receive your printed stickers. What if my art is low resolution? We suggest uploading a vector PDF or image of 300 DPI in the size of your printing. It is up to you to decide if you are ok with having them printed in low resolution. Otherwise, you can upload a new file with high resolution. If we see a problem, we will reach out to you. You can email us if you are concerned about it and we can see how we can help. Can I get a price without having to contact you? Do you have free samples available? Yes. We provide free samples you can ask for them here or fill out one of our pop-ups. 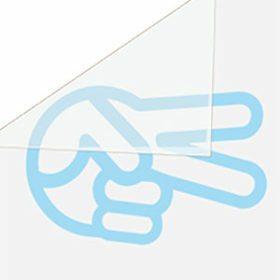 We will send you by a package by mail containing each style sticker we make. 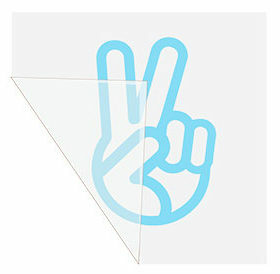 All the artwork will be a sample of our "Do Good Work", Peace Sticker. There is something in there for everyone. Order a free sample sticker kit today and get a Do Good Work Sticker! What is the ordering process with the Create a Sticker form? After you fill out the create a sticker form, your request comes to us via e-mail, and we get a real-time notification on the fly in our #Slack account. We either respond with a quick quote or we will respond via phone or email with questions before sending over a quote to ensure our accuracy. We look at all of your details to determine if the artwork is high enough resolution for what you want to accomplish. We double check all artwork and sizes to ensure we’re able to produce what you want. What can I expect from my quote? We use quoting software that will let us email you a detail of the pricing and project needs. The quote will include the delivery date, photos of the approved artwork you sent us. If you like it, you can sign it and accept it in your email. Once we receive it back, we will start your project. Please give us 7-10 working days. In most cases we ship way faster, but if you plan for ten days plus a few days for shipping your going to be safe in your planning. So think for 2 weeks. If you need them faster, make sure to ask us. We will try to go that extra mile to make you happy. We will send you an invoice that will be due upon receipt. You can pay with Credit Card, Check, Venmo, or Pay-Pal. Delivery is Free. In most cases, we like to go the extra mile and offer free delivery. If we can't do that orders are shipped via USPS or by FedX depending on your needs. We do more than make stickers. We do large format printing and signage for a wide range of organizations. If you have a project you’d like to discuss, we would love to talk with you.